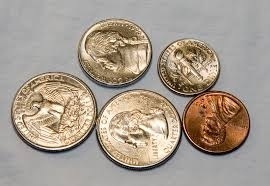 How many different coins would I need to make 78 cents. Try to solve this problem using the least amount of coins that you can. Try to solve this problem using quarters, nickels, dimes, and pennies. Good luck. Winners announced next Wednesday at the all school meeting. Good luck!